Another Report Shows Home Prices Taking A Big Jump : The Two-Way Prices were up 12.1 percent in April from a year earlier, according to the data trackers at CoreLogic. It's the latest sign of the housing sector's recovery. A sale pending sign in front of a home in San Francisco on May 28. 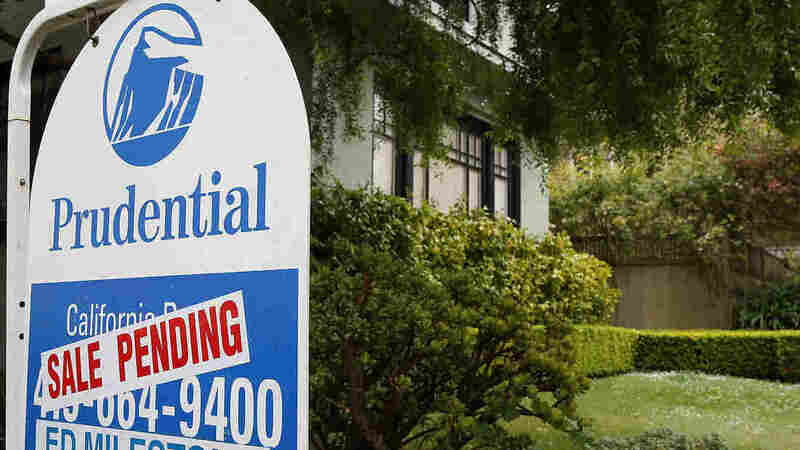 One week after the S&P/Case-Shiller indices showed a 10.9 percent jump in U.S. home prices from March 2012 to March 2013 — the biggest year-over-year gain in that data since April 2006 — there's another report showing a similar jump in April. CoreLogic, which collects data on real estate sales, says home prices were up 12.1 percent in April vs. April 2012. According to The Associated Press, it's the largest year-over-year increase in CoreLogic's data since February 2006. Reuters notes that "prices have been gaining for over a year as the housing market turned a corner, helped by low interest rates, a pick up in sales and less available supply." Economists watch home sales closely. They're a major indicator of consumer confidence. Also, when home sales rise, the ripple effects spread out through the economy as new owners buy furniture and appliances or put money into renovations and repairs.